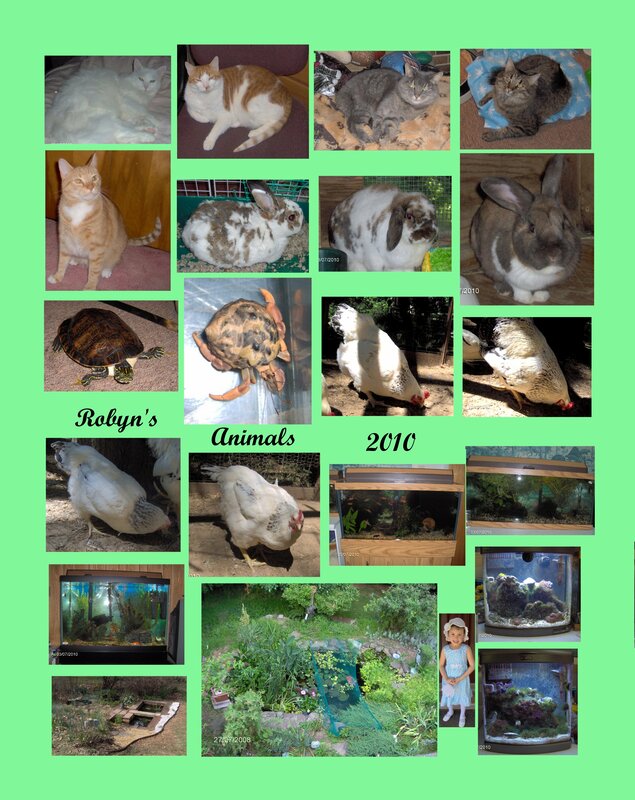 At each page there is information on my animals including pictures, descriptions, dates, and stories; general care and maintenance; newsgroups, catalogs, and web sites. African Pygmy Hedgehogs - I have moved my two hedgehog pages to their own subdirectory with many pages. The pages include care, links, and the story of my hedgehogs. Cats - I have moved my three cat pages to their own subdirectory with many pages. The pages include cats who had breast cancer, kidney failure, and diabetes. 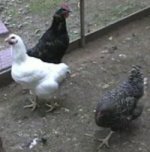 Chickens - I have moved my four chicken pages to the bird subdirectory with many pages. Guinea Pigs - I have moved my two guinea pig pages to their own subdirectory with more pages. Rabbits - I have moved my five rabbit pages to their own subdirectory with many pages. Sailfin Lizards - I have moved my three sailfin lizard pages to their own subdirectory with a few more pages. Turkeys - I have moved my one turkey page to the birds subdirectory with a few pages. Turtles - I have moved my 11 turtle pages to their own subdirectory with many pages. Insects - I have moved my 9 insect pages to their own subdirectory with many pages. I now have a current list of all my living animals here. 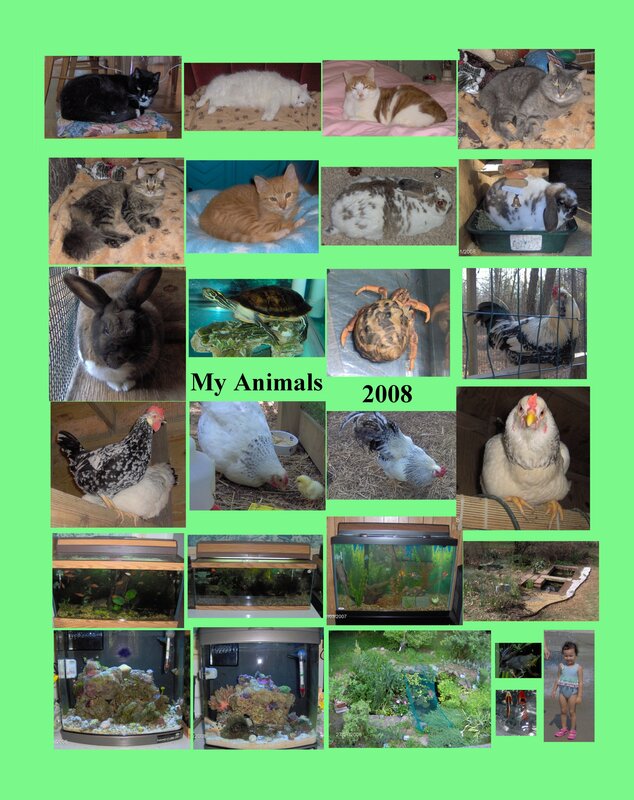 I made a large collage photo (for printing and framing) of my animals on 11/5/08. Click here to see it. Be warned; it is big! It includes all my current (11/5/08) 16 non-aquatic, non-wild, non-insect animals as well as photos of all of my aquariums and my two largest ponds. An updated photo for 2010 can be seen here. All Pets Directory - this site has sections on all sorts of pets so it does not fit under just one of my web sites but most of them. For those of us who have lost cherished animals in our care, check out The Rainbow Bridge and Pet Loss for memorial and grief information. Animal Photos by Foto Search (link request). Amazing Pet Place - a store, link request, I have no opinion of the company. Bruning.com - dedicated to helping pets and animals get the medical treatment, care, food and shelter they deserve. Please visit the five sites below where you can help save a small piece of rainforest, help the big cats, help the oceans, help the primates, and help pets in need at no cost to you! This site won this award on 10/12/02 through none of my doing. It is the Critical Mass Award, an award for having a large enough web site of interest. It should been for my main web page but they put it out for this page. The award came with the following message: "Congratulations! Your site definitely qualifies for the 'Critical Mass Award.' A very nice site, good design, clever graphics, great photos, and you have provided your visitors with content that is informative, entertaining, presented well and easy to access. A worthy enterprise and a positive contribution to the Web....Thanks for making the Web a more interesting, fun and attractive place to visit. I really enjoyed my visit to your site and will return again when time permits...."
This page used to have a counter on it at my old site. The final count hit was 7976 from 3/99 to 9/27/03. Not that many! The server reset the counter on 9/25/00. The last recorded hits was 2814 on 9/1/00 since March of 1999. The server reset the counter sometime in early March of 1999 for an unknown reason. The number of visitors was not recorded but should have been near 3000 between 9/97 and 3/99. Check out my interactive page where you can do things!